"Christian friends, your voices raise. Joy that martyrs won their crown, opened heaven's bright portal, when they laid the mortal down for the life immortal." Today, December 26, we celebrate Saint Stephen’s Day, the feast day of Saint Stephen the Protomartyr (died 33). Prophetically, Stephen’s name means “crown,” and he was the first disciple of Jesus to earn the martyr’s crown. Saint Stephen recognized the love of Our Lord and Savior, and was willing to die for that love, on the day after the commemoration of his birth. As the light of Christmas burns brightly in our hearts, we turn our attention to this holy man who held true to the teachings of Christ, dying a glorious death for his beliefs! The little we know about Saint Stephen is recorded in Chapters 6 and 7 of the Acts of the Apostles. 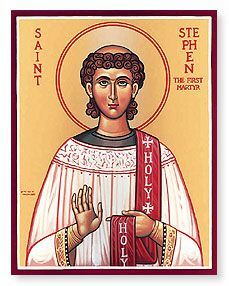 As Scripture tells us, Stephen is the most famous of the seven deacons of the early Church—charged with caring for the widows and the poor. He was a man filled with grace and power, through whom God worked many miracles. Such was his wisdom that many were converted and became followers of Christ. 5 This proposal pleased the whole group. They chose Stephen, a man full of faith and of the Holy Spirit; also Philip, Procorus, Nicanor, Timon, Parmenas, and Nicolas from Antioch, a convert to Judaism. 6 They presented these men to the apostles, who prayed and laid their hands on them. 7 So the word of God spread. The number of disciples in Jerusalem increased rapidly, and a large number of priests became obedient to the faith. 8 Now Stephen, a man full of God’s grace and power, performed great wonders and signs among the people. 9 Opposition arose, however, from members of the Synagogue of the Freedmen (as it was called)—Jews of Cyrene and Alexandria as well as the provinces of Cilicia and Asia—who began to argue with Stephen. 10 But they could not stand up against the wisdom the Spirit gave him as he spoke. As we can read, Stephen’s wisdom, grace, and influencing of hearts caused great concern to certain Jewish leaders-- members of the Synagogue of Roman Freedmen. These men debated with Stephen, but proved no match for the spirit of God shining through his words. Of course, this led to fear, and eventually Stephen was persecuted on false charges of blasphemy. Led before the Sanhedrin, he calmly—peacefully—spoke without fear regarding the Lord’s guidance throughout Israel’s history, as well as Israel’s idolatry and disobedience. He then claimed that his persecutors were showing this same spirit. Saint Stephen spoke about Jesus, showing that He is the Savior, God had promised to send. He scolded his enemies for not having believed in Jesus. At that, they rose up in great anger and shouted at him. But Stephen looked up to Heaven and said that he saw the heavens opening and Jesus standing at the right hand of God. 1 Then the high priest asked Stephen, “Are these charges true?” 2a To this he replied: “Brothers and fathers, listen to me! 44 “Our ancestors had the tabernacle of the covenant law with them in the wilderness. It had been made as God directed Moses, according to the pattern he had seen. 45 After receiving the tabernacle, our ancestors under Joshua brought it with them when they took the land from the nations God drove out before them. It remained in the land until the time of David, 46 who enjoyed God’s favor and asked that he might provide a dwelling place for the God of Jacob. 47 But it was Solomon who built a house for him. 57 At this they covered their ears and, yelling at the top of their voices, they all rushed at him, 58 dragged him out of the city and began to stone him. Meanwhile, the witnesses laid their coats at the feet of a young man named Saul. 59 While they were stoning him, Stephen prayed, “Lord Jesus, receive my spirit.” 60 Then he fell on his knees and cried out, “Lord, do not hold this sin against them.” When he had said this, he fell asleep. (Acts 7: 1-2a; 44-59). Saint Stephen was dragged outside the city gates, and stoned to death for his beliefs. We are reminded of Christ, in the example of Saint Stephen: He embodied a love so strong and pure that he gave himself over completely in love, finding in the midst of suffering, pain, and death the perfect charity to pray for and forgive his executioners! On the day after the joyful triumph of Our Lord in birth, we are confronted with the loving triumph of Saint Stephen in death—and are reminded that self-giving love requires sacrifice and sometimes suffering… like not only Saint Stephen, but our Lord and Savior on the Cross! today we celebrate the entrance of Saint Stephen into eternal glory. He died praying for those who killed him. Help us to imitate his goodness and to love our enemies. We ask this through our Lord Jesus Christ, Your Son, who lives and reigns with You and the Holy Spirit, one God, for ever and ever. Amen.